Library endowments established through contributions to UH Libraries enable the purchase of unique resources to further enrich the Libraries’ collections. The list below presents the stories behind each endowment. Anne Reynolds Phillips was a long-time American literature teacher at the University of Houston. Upon her passing in 1976, her friends at the university collected money to establish an endowment in her name. The Anne Reynolds Phillips Memorial Endowment purchases books in American realism, Ms. Phillips’s area of expertise. Richard and Belle Johnson created the fund in 1993 to support the acquisition of books, serials, visual recordings or sound recordings, and other associated materials related to the arts (i.e., art, drama, literature, music). The late Mr. Johnson was chairman and publisher of the Houston Chronicle and Mrs. Johnson is involved with the University and many local community organizations. Reading and literacy issues are high priorities for both of them. Bill and Mimi Walker collectively possess five degrees from UH. The Walkers have supported the Libraries and other programs at the university for more than 20 years. They established their endowment with an initial gift in 1994. The fund provides support to acquire books, recordings, and scores for research and study at the Music Library. This endowment perpetuates their deep interest in music and enables them to make a difference for UH. Upon his death in 1978, an endowment was established to purchase books in his interest area of Canadian business. On June 10, 1991, the Conoco Endowed Book Fund was established with a gift and three-year pledge from Conoco, Inc. to create a substantial endowment. The money generated by this endowment purchases books in engineering and other fields related to Conoco industries. In 2003, the endowment’s name was changed to ConocoPhillips to reflect a corporate name change. Through its commitment to education at UH, Conoco is molding generations of highly-trained future employees. 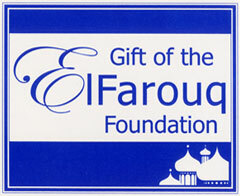 A $50,000 contribution awarded by the ElFarouq Foundation is the basis of this endowment to support the acquisition of Arabic and Islamic studies publications and other materials. Elizabeth D. Rockwell is a great supporter of the University of Houston. She has been generous to many UH areas including business, law, science, math, alumni, and the libraries. The University honored Elizabeth Rockwell with the 1992 CBA Alumni Award and the 1996 University of Houston Alumni Association Distinguished Alumna Award. Ms. Rockwell is a fourth generation Houstonian and an expert in estate, retirement, investment, and tax planning. The Elizabeth D. Rockwell Endowment for Special Collections and Archives supports and enhance the purchase, preservation, and cataloging of special collections and archives materials in MD Anderson Library. The Evelyn Claire McLaughlin Memorial Fund is used to purchase contemporary American and British fiction and poetry in novels and magazines. Frell Albright was a major contributor to the University of Houston Libraries for more than 20 years. Mr. Albright was a gifted artist who served for many years as the graphic advisor for the Friends of the University of Houston Libraries. He took a special interest in the Department of Special Collections, and made numerous valuable donations over two decades. In 1983 Mr. Albright donated his Stephen F. Austin Collection to MD Anderson Library. He was honored, also in 1983, by the University of Houston Alumni Organization with the President’s Service Award, the highest honor to be bestowed on a non-alumnus. An endowment was created by Mr. Albright’s family and friends to benefit Special Collections after his death. Funded in 1987, the Frell Albright Memorial Endowment is dedicated to buying rare books and artifacts relating to Texas history, especially in the areas of topography, art and art history. The endowment also funds the purchase of early German printing and Texana materials from the era before Texas achieved statehood. In 1978, the Friends of the Library Endowment was established by an anonymous donor. For twenty years, Helen M. Douthitt taught American history at the University of Houston. Her generosity and benevolence forever will be appreciated by the Libraries. 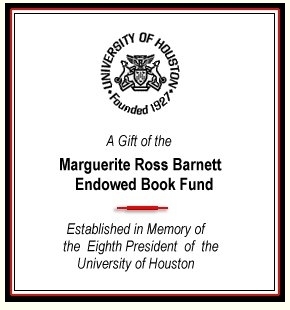 One of her final acts of generosity was to send a check to the University of Houston Libraries for a lifetime membership in the Friends of the Libraries. Upon Ms. Douthitt’s death in 1978, her friends and former colleagues raised money to start the Helen M. Douthitt Memorial Fund. The money from this endowment buys books on American history for the Libraries’ collection. Howard Barnstone was a nationally acclaimed architect, author, and teacher. He is best known for designing the Rothko Chapel in Houston. He also wrote The Galveston That Was and The Architecture of John F. Staub: Houston and the South. He was one of a very select few admitted to the American Institute of Architecture on three counts: design, literature, and teaching. At the University, Mr. Barnstone served on the architecture faculty for nearly 40 years, where he specialized in urban design. When he passed away in 1987, his family asked that friends pay their respects by making donations, in lieu of flowers, to support the architecture collection at the University of Houston Libraries. These monetary gifts were consolidated into the Howard Barnstone Memorial Endowment. The funds from this endowment are used to purchase many architecture books that otherwise would be unavailable to the William R. Jenkins Architecture & Art Library. Jack was a student at the University of Houston from September 1946 until May 1950 when he received his BS degree from the College of Arts and Sciences. As a student, he was Advertising Manager and later Business Manager of the campus newspaper, the Cougar, and held the same positions for the yearbook, The Houstonian. He met his future wife, Mary Lou Moffitt in 1947 while both were students. They married in 1949. He was President of the Press Club in 1949 and helped locate a cougar to purchase from his childhood friend, Manuel King of Brownsville, TX. He arranged for air transportation to fly the cougar, later named Shasta, to Houston. It was purchased by the University service club. In 1950 he was selected one of ten “Outstanding People” among the student body on campus. He was an avid fan of the Football team and traveled to all of the out of town games with the team. He performed at Frontier Fiesta in 1947, 1948, 1949, and 1950 in the Cavalier Theater doing a comedy singing routine. Thirty years later, he performed the same routine at a Theater Under the Stars Gala called, “Highlights of Frontier Fiesta”. He also performed in the Varsity Varieties Show of the Red Masque Players as a student. He was an original resident of Veteran’s Village, the army house trailer community on campus that served as housing for returning World War II veterans. After graduation he was appointed as the director of the drive to raise money on campus for the Student Activity Center building which was built in the late 50’s. In 1959 he was appointed as the Executive Director of the University of Houston Alumni Organization (succeeding Johnny Goyen, the first person to hold that position). He held that position for several years until he was appointed as head of the Port of Houston Defense and Disaster Planning. He served under Mayor Roy Hofhienz as Operations Director of the Civil Defense Department. In 1957 he was appointed to a position in what is today called Homeland Defense. He was Five State Director of Operations for the Office of Civil and Defense Mobilization in the Executive Office of the President (John F. Kennedy). His responsibilities included the Natural Disaster Relief responsibilities, now held by FEMA. He got special recognition for his handling of the relief efforts following Hurricane Audrey that hit Cameron, Louisiana in 1957, killing 500 people and 35,000 head of cattle and destroying 5,000 homes. 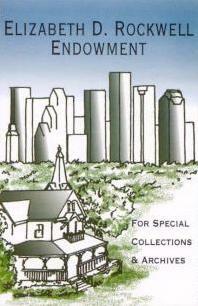 In the 1960’s, 70’s, 80’s, and 90’s he was a successful Real Estate Developer in Galveston, Austin and Houston. He was founder of the Sideline Coaches Association, an organization that promoted UH football. Until his death in 2004 he was an avid supporter of the University of Houston with particular emphasis on the Alumni Organization and athletics. Dr. Jay Kochi, a distinguished scientist, UH faculty member and the Robert A. Welch Professor of Chemistry, and his wife, Marion, made a special gift to establish a new endowment with a chemistry emphasis. 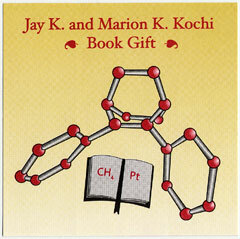 Income from the Jay K. and Marion K. Kochi Library Endowment augments the collection of chemistry publications each year by supporting the purchase of books, publications and other materials as suggested by the UH Department of Chemistry faculty. Dr. Kochi, an organic chemist, earned his doctorate from Iowa State University. Among his many professional honors, he is a member of the National Academy of Sciences and a recipient of the Alexander Von Humboldt U.S. Senior Scientist Award, the American Chemical Society’s Arthur C. Cope Scholar Award, and the James Flack Norris Award, given by the Northeastern Section of the American Chemical Society for outstanding achievement in the teaching of chemistry. The Rockwell Fund, Inc. created this endowment in memory of Joe M. Green, Jr. to acquire books in the areas of religious studies, general humanities, and the sciences. Former UH classmates John and Rebecca Moores are recognized as two of the most generous philanthropists in the nation. After graduating with degrees in law and economics, Mr. Moores founded the extremely successful BMC Software company. Their gift in 1992 allowed the University to build the new Moores School of Music and the state-of-the-art Athletic/Alumni Facility. It was his idea to combine the alumni office and the athletic building, and to place a world-class performance hall in the music school, to draw the most attention and support to the University of Houston. In 1992 they also established a library endowment that is used to purchase materials in many subject areas that rotate annually. In March 1978, Dr. John Hugh Hill established the Laurita L. and John Hugh Hill Fund. Dr. Hill and his late wife were scholars of medieval history. They collaborated on numerous books and brought national attention to medieval studies in the Southwest. In order to perpetuate these studies on the University of Houston campus, Dr. Hill donated their collection of 400 volumes on medieval studies. He then established the endowment to ensure this collection’s indefinite growth. Marguerite R. Barnett’s brief tenure as UH President was filled with promise. She came to the university in 1990 as the top-ranked female African American college administrator in the nation. Dr. Barnett brought an energy and enthusiasm to the campus when she vowed to make UH the top urban research university in the country. She spearheaded efforts to create a partnership between the university and the surrounding community. However, time was not on Dr. Barnett’s side. She died of complications due to cancer in February 1992. At her memorial service, UH interim President James Pickering spoke of Dr. Barnett’s goal and her impact on the university. “For us, she articulated a dream, a dream that UH can become the premier 21st-century urban university. It will do so by reaching out and engaging the city, its citizens and problems in a way that makes a significant and lasting difference in the character and quality of the common life we share together.” An endowment was created by the faculty, staff, and friends of Dr. Barnett in 1992. They quickly raised $35,000 to begin an endowment in political science, Dr. Barnett’s field of study. 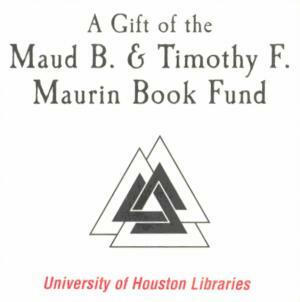 In 1996, Gertrude Maurin established this endowment through a bequest to the UH Libraries. The Maud B. & Timothy F. Maurin Book Fund, named after Gertrude’s parents, provides for the acquisition of materials in fields related to parapsychology. The Melita Franzheim Memorial Book Fund was created the Honorable Kenneth Franzheim in memory of his daughter in 1999. The Franzheim family has had a long and close relationship with Houston and UH. The Houston skyline of the 1920s to 1950s was dominated by the work of Franzheim’s father, who was closely associated with the UH School of Architecture. Kenneth Franzheim II donated the one millionth volume to MD Anderson Library. Barbara Franzheim, Melita’s mother, donated Melita’s extensive collection of books to the UH Special Collections Department. Melita Franzheim was characterized by her family as a wonderfully intelligent and creative person. A gifted artist, her interests included Classical and Renaissance literature and painting, languages, and visual arts. She was a student of mosaic art and created numerous works in that medium. The Melita Franzheim Book Fund is used to purchase texts in the areas of literature, languages, art, and general humanities. The Mindora Bagby McCallick Memorial Collection on Wildlife of Texas and the Southwest was created in March 1974 by the dean of the College of Technology, Hugh E. McCallick. The endowment has been used by the library to build a sizeable collection of literature on the flora and fauna of the Southwest. Earnings from the Monsignor John T. Nicholson Memorial Fund benefit the University of Houston in several ways. Each year, $100 is awarded to a deserving student who excels in German. The remainder of the annual earnings are designated to the UH Libraries and are used to purchase books, musical scores or other materials in the fields of English history, horticulture or music. Wallace C.D. Gee served on the board of the Friends of the Library. Upon his death on April 19, 1983, his family, remembering the great value he placed on education, requested that Mr. Gee’s friends make donations to the library for the acquisition of books. According to his son Bob Gee, Wallace Gee also “had a strong sense of commonwealth — he looked out for the best interests of the community.” As the fund grew, an endowment was created to perpetuate Mr. Gee’s name and to benefit the library for generations. The proceeds from the Wallace C.D. Gee Endowment Fund go toward purchasing books in the finance, real estate, and Chinese studies subject areas.